Growing up, we learn and develop our behaviours, morals and attitudes from our family, our friends and peers. Over time we form a set of core values that guide our decisions and actions every day of our lives. In business, core company values have a similarly important part to play, helping to define a company in the eyes of its staff, clients and the general public. We’ve put together seven reasons why core company values are important in achieving success. Simply put, core company values set the tone of the business, set out what is expected of staff, portray its personality to the wider world and communicate how it does business. Shared company values provide a solid foundation that underpins all the company’s activities, internally and externally. Defining a core set of values can often be dismissed as a gimmick or a triviality. However, it’s vital that all involved in the company are clear on what the company is trying to achieve, especially as it grows and more people come on board. Defining, communicating and adhering to the core values can provide clarity for staff and customers alike. We all like to feel part of something and to spend time with people that share our values and respect our goals and ambitions. Communicating company core values in the recruitment process will attract the people that fit best with those values and ensure a focused and motivated team of staff. Customers looking for the goods or services that the company offers will base their buying decisions on many factors. However, the old adage that “people buy people” is still a big factor, and if a company is clearly communicating values which chime with the customers’ own, they are more likely to choose that company. Once on board, putting the customer at the heart of the core values makes them feel valued and builds loyalty and trust. Examining key growth decisions that the company needs to make by considering how the potential outcome of the decision fits with the company’s core values helps make the decision-making process simpler, smoother, and quicker. 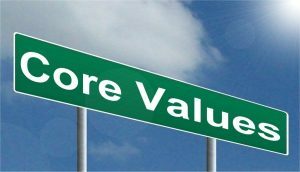 Core values underpin daily company activity, and should there be any performance issues in the company team, discussing the values and the importance of delivering them consistently is a better way to address performance issues than simply being critical. Knowing what the company stands for, knowing how and why it operates the way it does and seeing positive results from the way it operates can all build confidence. A solid foundation of core values gives courage, strength, and energy to all involved in the company to pull together and achieve success.